PREMIUM QUALITY - Great jerky texture with no fishy taste or smell, using only fresh handline caught Wild Ahi (Yellowfin) Sashimi Grade Tuna. Wild fish jerky at its best. 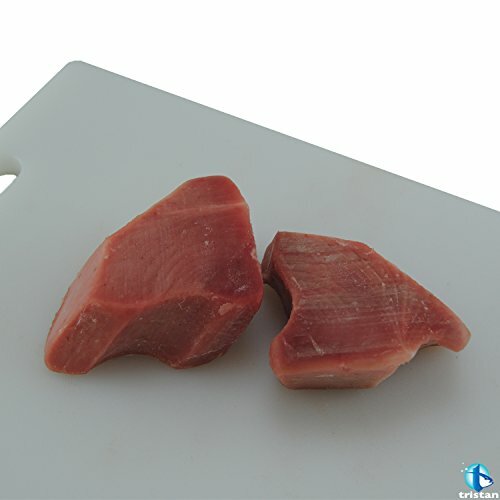 SASHIMI GRADE TUNA - Itsumo is a leading producer of tuna products sold in North America and Japan. We supply fresh Sashimi Grade Tuna Steaks to top Restaurants and Supermarkets throughout the United States and Canada, which is why we are able to use this same high quality tuna for our Wild Ahi Tuna Fish Jerky. ALL NATURAL INGREDIENTS - We use 100% natural ingredients which are gluten free, contain no preservatives, no nitrites, no added msg and is low sodium. We pride ourselves in making minimally processed healthy &amp;amp; clean protein products, which are high in omega 3. Dairy Lactose Free. 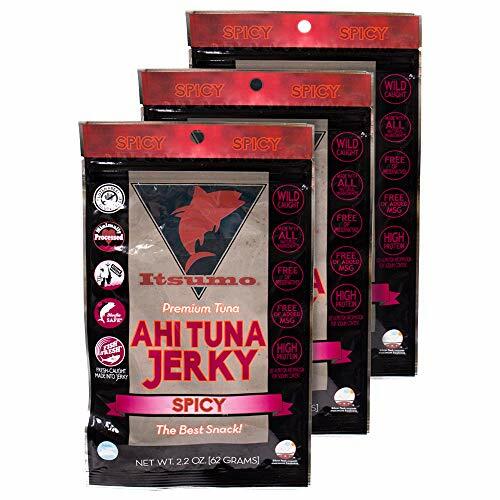 READY TO EAT - Packaged in a resealable bag to keep your tuna jerky fresh in between healthy snack breaks or perfect for camping &amp; backpacking to give you that protein boost when you need it. SUSTAINABLE FISHING - Our Jerky only uses fresh wild handline caught ahi yellowfin tuna fish. We are a Bluefin Tuna Safe & Dolphin Safe supporting company. Itsumo Wild Ahi YellowFin Tuna Fish Jerky is made from premium quality Japanese Sashimi grade fish. We catch these wild fish using hand line techniques as part of our sustainable commitment. We then process the raw fresh fish by hand. This minimal processing and simple natural ingredients keeps the high quality of clean protein. No artificial ingredients, flavors or colors, free of preservatives. Gluten and dairy free. There is no added MSG in our product. Perfect for almost any diet. Our pouch packaging is high quality, ensuring maximum freshness of our premium tuna that we have worked hard for. There are notches at the top of the pouch for easy opening. And it is resealable for convenient snacking. Enjoy the worlds best tasting Tuna Jerky, Itsumo products are developed & produced using decades of knowledge from world tuna experts in Japan. Itsumo means "Always" in Japanese, as we believe in always keeping true to our vision of healthy & nutritious food for families to eat. - Always Premium Grade Tuna Fish - Always Minimally Processed - Always 100% Natural Ingredients - Always Clean & Safe Protein Itsumo History:Itsumo is the brand of an American who has spent over 20 years living in Japan and working in all areas of the Japanese Tuna Industry, from catching tuna fish on the boats, to the auctions in Tsukiji fish market, the biggest and oldest fish market in Japan. The very best in natural, ahi tuna. Tristan utilizes ULT (Ultra low temperature) freezing technology right on the vessels. Once harvested, the tuna is immediately processed and frozen to an internal temperature of -76 F. This freezing technique locks in the just caught characteristics of the tuna and when properly refreshed, blooms the distinctive ruby red color. And Tristan NEVER uses CO to treat their products. 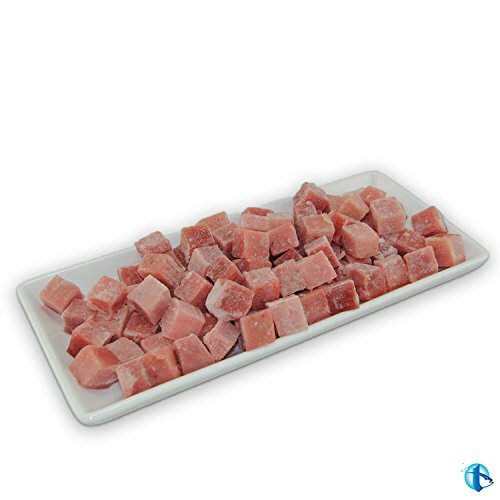 These 5/8" cubes are perfect for poke bowls, salads, appetizers, or as a dip. All natural - no additives or preservatives. Ahi, otherwise known as "Yellowfin Tuna" is flown in OVERNIGHT from Hawaii or Fiji and Cut to Order Just for you. 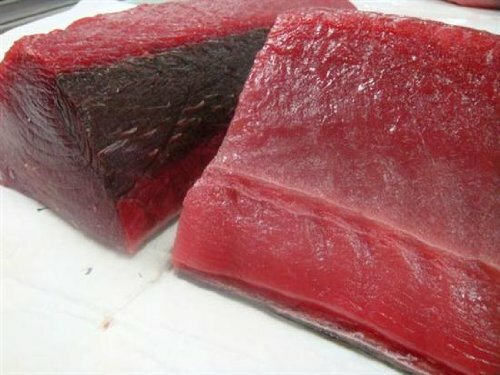 This is the premier choice for Sushi Lovers, Its purplish flesh and sweet meat are ideal not only for sushi lovers, but is absolutely wonderful seared, and left rare on the inside.